Sting incorporated heavy elements of jazz, classical, and worldbeat into his music, writing lyrics that were literate and self-consciously meaningful, and he was never afraid to emphasize this fact in the press. For such unabashed ambition, he was equally loved and reviled, with supporters believing that he was at the forefront of literate, intelligent rock and his critics finding his entire body of work pompous. Either way, Sting remained one of pop's biggest superstars for the first ten years of his solo career, before his record sales began to slip. Before the Police were officially disbanded, Sting began work on his first solo album late in 1984, rounding up a group of jazz musicians as a supporting band. Moving from bass to guitar, he recorded his solo debut, 1985's The Dream of the Blue Turtles, with Branford Marsalis, Kenny Kirkland, and Omar Hakim. The move wasn't entirely unexpected since Sting had played with jazz and progressive rock bands in his youth, but the result was considerably more mature and diverse than any Police record. The album became a hit, with "If You Love Somebody Set Them Free," "Love Is the Seventh Wave," and "Fortress Around Your Heart" reaching the American Top Ten. Sting brought the band out on an extensive tour and filmed the proceedings for a 1986 documentary called Bring on the Night, which appeared alongside a live double album of the same name. That year, Sting participated in a half-hearted Police reunion that resulted in only one new song, a re-recorded version of "Don't Stand So Close to Me." Following the aborted Police reunion, Sting began working on the ambitious Nothing Like the Sun, which was dedicated to his recently deceased mother. Proceeding from a jazz foundation, and again collaborating with Marsalis, Sting worked with a number of different musicians on the album, including Gil Evans and former Police guitarist Andy Summers. The album received generally positive reviews upon its release in late 1987, and it generated hit singles with "We'll Be Together" and "They Dance Alone." Following its release, Sting began actively campaigning for Amnesty International and environmentalism, establishing the Rainforest Foundation, which was designed to raise awareness about preserving the Brazilian rainforest. An abridged Spanish version of Nothing Like the Sun, Nada Como el Sol, was released in 1988. Sting took several years to deliver the follow-up to Nothing Like the Sun, during which time he appeared in a failed Broadway revival of The Threepenny Opera in 1989. His father also died, which inspired 1991's The Soul Cages, a dense, dark, and complex album. Although the album peaked at number two and spawned the Top Ten hit "All This Time," the record was less successful than its predecessor. Two years later, he delivered Ten Summoner's Tales, a light, pop-oriented record that became a hit on the strength of two Top 20 singles, "If I Ever Lose My Faith in You" and "Fields of Gold." At the end of 1993, "All for Love," a song he recorded with Rod Stewart and Bryan Adams for The Three Musketeers, became a number one hit. The single confirmed that Sting's audience had shifted from new wave/college rock fans to adult contemporary, and the 1994 compilation Fields of Gold: The Best of Sting played to that new fan base. Three years after Ten Summoner's Tales, Sting released Mercury Falling in the spring of 1996. Although the album debuted highly, it quickly fell down the charts, stalling at platinum sales and failing to generate a hit single. Although the album failed, Sting remained a popular concert attraction, a feat that confirmed his immense popularity regardless of his chart status. Released in 1999, Brand New Day turned his commercial fortunes around in a big way, though, eventually going triple-platinum and earning two Grammy Awards. Issued in 2003, Sacred Love also did well, and Sting spent several years with the reunited Police. After several years of work, Sting completed his musical The Last Ship in 2013. Initially, he introduced the piece as a solo album released in September of 2013, but the musical -- set in a struggling shipyard in the '80s -- made its Broadway debut in 2014. 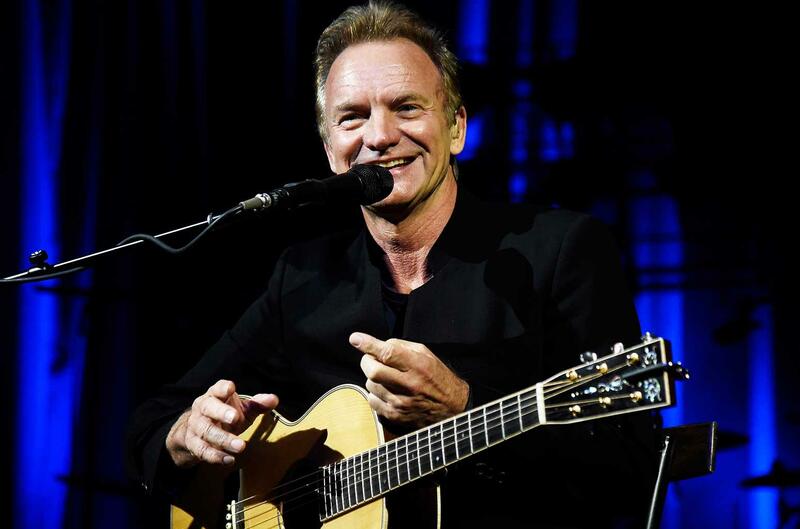 Sting spent the next two years touring, sometimes co-headlining with Paul Simon, and then in late 2016 he released 57th & 9th, his first album of pop songs in 13 years. The album was recorded in a few weeks with contributions from a pair of long-time collaborators, guitarist Dominic Miller and drummer Vinnie Colaiuta, plus drummer Josh Freese and guitarist Lyle Workman. In 2017, Sting was honored alongside Wayne Shorter and Metallica with the Polar Music Prize, an annual award originating from Sweden recognizing greatness in the world of music. 2018 brought an unlikely pairing as Sting issued a joint reggae album with Jamaican singer Shaggy. Obliquely titled 44/876 after the two musicians' country calling codes, it marked Sting's first-ever collaborative duo album as well as his return to the U.K. Top Ten chart.